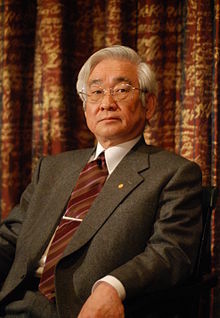 Toshihide Maskawa (or Masukawa) (益川 敏英, Masukawa Toshihide, born Februar 7, 1940 in Nagoya, Japan) is a Japanese theoretical pheesicist kent for his wirk on CP-violation wha wis awairdit ane quarter o the 2008 Nobel Prize in Pheesics "for the discovery o the origin o the broken symmetry which predicts the exeestence o at least three faimilies o quarks in naitur." ↑ "The Nobel Prize in Physics 2008". The Nobel Foundation. Retrieved 2009-10-17. This page wis last eeditit on 17 Mairch 2017, at 21:57.